This month we are taking our Urban Food Challenge to East London for a double bill edition as part of the Urban Food Fortnight run by the London Food Link, which is the umbrella for all of Sustain‘s initiatives in London. What is an Urban Food Challenge? It’s a walking treasure hunt within a neighbourhood that takes participants through a series of three fun challenges presented by local food & drink initiatives showcasing their sustainable practices. At the end, participants are led to a surprise location where a delicious sit-down lunch awaits them. At the table, both participants and collaborating initiatives sit together to share some good food while we facilitate a laid-back discussion on the food sustainability topics touched upon during the treasure hunt and personal experiences are shared. What is the Urban Food Fortnight? Urban Food Fortnight is London Food Link’s annual celebration of the fantastic food and drink being grown, made, cooked and saved in the capital, this year taking place between the 9th and 25th September. Part of the charity Sustain, London Food Link works throughout the year as the voice for good food in London. It runs campaigns and initiatives to help create a healthy and sustainable food system for all, and joins the dots between growers, makers, cooks, sellers, savers and enjoyers of good food across the boroughs. 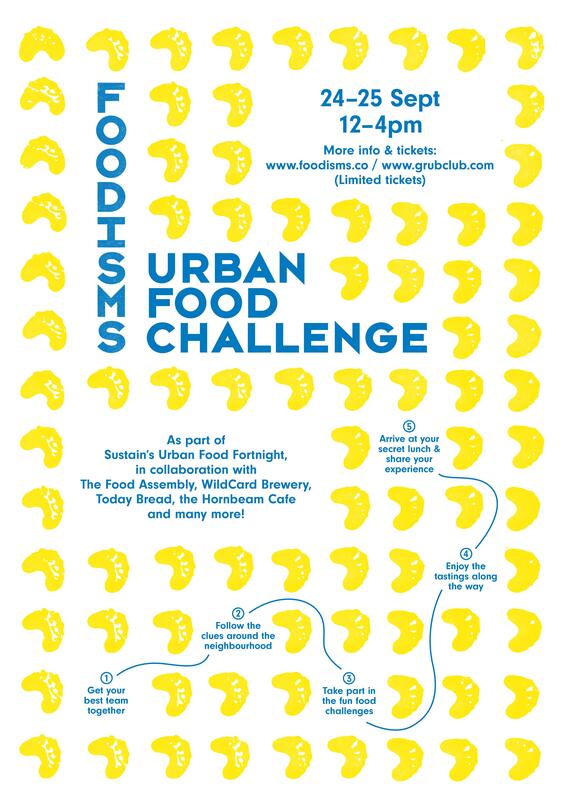 What exactly does this Urban Food Challenge entail? Participants are divided into 3 teams of 8 people max. Tickets can be purchased via the Grub Club platform. Once you’ve booked your ticket, you will receive the exact meeting location via email with some tips on how best to prepare yourself for this adventure the day before the event. Any further questions? Email us at hi@foodisms.co, we’d be happy to help!